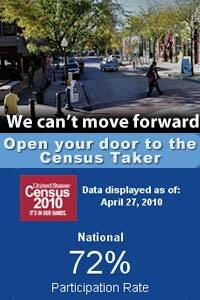 I am registered to vote and I have a drivers license, but I have not received a census form in the mail. Instead, a man buzzed my security system yesterday, gave me his name, said he was from the census, and asked to enter my home. I hung up. So he buzzed again repeatedly. Eventually, he figured out some other way of getting into my security building and started banging on my door for an extended time period. I had to wait for him to go away, so I could go buy an organic onion to complete a recipe I was cooking. From the help wanted signs posted around Los Angeles, I believe the government is paying $17 an hour to have unwelcome strangers knock on my door. I think a 44 cent stamp would be a way more economically responsible way to get me to not fill out the census form. And don’t even get me started on how, if we can file taxes electronically, it ought to be feasible, cheaper, and more effective to use an online system to count everyone. Why don’t I give my data to the census? The first time I was ever asked to fill out a census form was when I was living in a townhouse with 13 punk rockers. I was afraid that, although we always paid our rent on time, we could get evicted if our landlord found out how many people actually lived there; I was on the lease, but he thought there were only 4 of us. Well, he probably knew there were more than 4 of us, but he couldn’t come inspect himself because he had a restraining order against him for his own properties, as a result of having stalked the previous tenants. The census taker told me I would go to jail, if I did not fill out his form. I asked him how anyone would know who to arrest, if I didn’t fill out the form, and pointed out that, if they knew who to arrest, they didn’t need me to fill out the form. Although I was assured, at the time, that my data was all confidential, I later found out that I knew people who worked for the census who very likely would have seen the form. When the census hires workers who respond to photocopies on telephone poles, how selective are they being in picking people really sensitive to privacy issues? When Social Security was first introduced, its proponents swore that a Social Security number would never ever be used to identify Americans; they would only be used to organize retirement benefits. So now there are three primary private agencies who file all their data according to Social Security number. Then there are dozens of secondary agencies which do the same thing. Not one of those has my data remotely correct. I mean, they literally can’t even get my name and gender consistently right, much less what state I live in or anything complicated like that. Private industry usually has more stake in accuracy and efficiency than government, so, if they can’t keep that straight, you know the government can’t. Yet there is a new proposal in front of the US Senate to introduce BELIEVE. BELIEVE stands for Biometric Enrollment, Locally stored Information and Electronic Verification of Employment. The idea is that Social Security cards should carry electronic chips and photographs and all employers should be required to do something or other with them or face stiff penalties. If the government is so concerned about American jobs, maybe it shouldn’t have given all our tax dollars to, for example, JP Morgan Chase, who used the interest-free loan to outsource 40,000 American jobs overseas. JP Morgan Chase was supposed to pay it back to America partly in the form of small business support, such as ARC loans, but I know from personal experience that they simply aren’t putting those through; Chase is not rejecting such loan apps because that would look bad, so they simply never quite file them. So the economy is at such a hideous low such that almost everyone I know is impacted by it, in different negative ways, no matter what their variety of employment. And my elected representatives think what they really need to do is crack down on possible illegal aliens who are actually working in this country, as opposed to leaching off our welfare system, and put a bigger paperwork burden on businesses who employ people? Really? And what are the odds that BELIEVE will not be used to further decrease our freedom and privacy, beyond even what they are talking about now? The more Big Brother is all about my data, the less I want them to have. So, in conclusion, this is why I do not fill out the census form: (1) Privacy concerns, (2) I’m offended by questions about race, (3) knowledge of history tells me that government data almost surely will be used for more than what is stated in advance, (4) disgust with the wasteful way the census is conducted, and (5) being totally creeped out by the way they send unwelcome visitors to my door, in an electronic age, where that is completely unnecessary, intrusive, and potentially dangerous. Open up, baby, I’m from the census, I swear. Yes, I know congressional representation is based on the census. I know much government aid is based on the census. One friend of mine wants to fill out his census form (assuming he ever gets mailed one because he doesn’t answer the door for strangers either) claiming that he has 8 million plus individuals domiciled in his home. He figures California needs the money. Which brings up the question of how the census bureau deals with forms which seem obviously fraudulent. Who decides? How often do census takers get sick of chasing private people like myself and just fill out a form with plausible info? California really does need the funds, though, so I hope somebody just goes ahead and databases the more than 8 million residents at his address. Did You Vote Today and Read Those Referendums? Who wants a Google + invite?